In 1959, 1 -methyl-1 -nitroso-3-nitroguanidine (MNNG) was found to increase the life span of mice bearing leukaemia L1210 ( 1). While MNNG did not have sufficient activity to warrant extensive clinical testing, the demonstration of antitumour effect gave impetus for further evaluation of the N-nitroso class of compounds as potential antineoplastic agents. 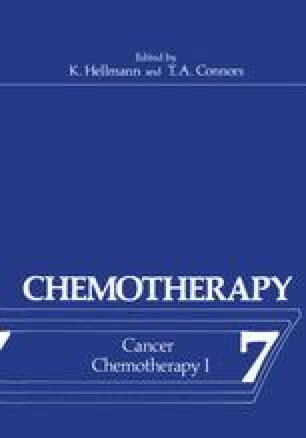 In 1961 1-methyl-1-nitrosourea (MNU) was reported to be not only more effective against intraperitoneally implanted L1210 than MNNG, but also was capable of penetrating the blood-brain barrier; MNU produced limited but reproducible antitumour activity in mice with intracerebral leukaemic cells ( 1). Since that time over 300 aIkyInitrosourea compounds have been screened for antitumour activity, the majority of the synthetic work having been undertaken by Montgomery, Johnston and co-workers at the Southern Research Institute (3).